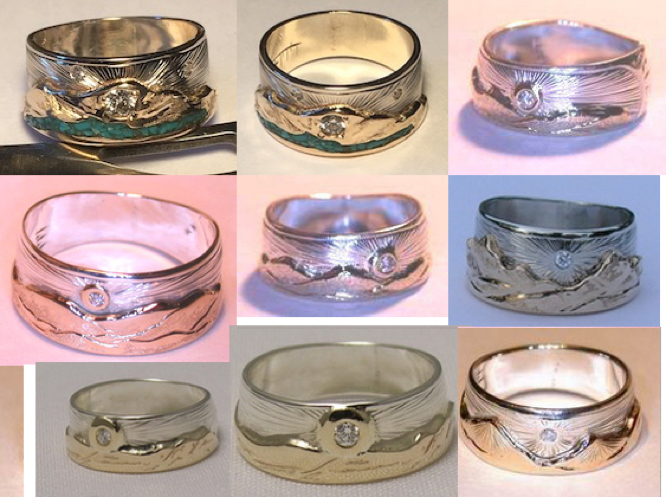 Mountain Rings – by Bearclaw Native Indian Jewelry. 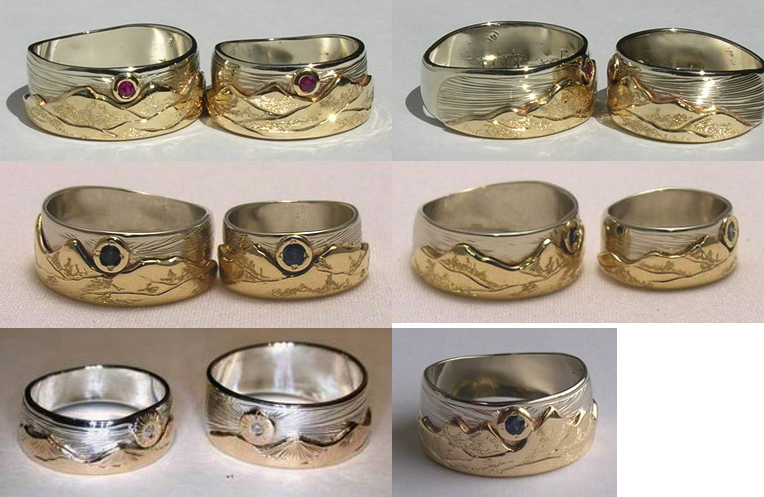 Appliqued Mountain Rings using different golds, ( yellow, rose, white or green ), silver or platinum soldered on a ring’s base and then carved and detailed to form the mountains of your choice. 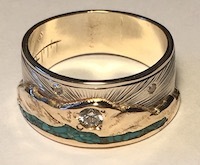 , Native Chipewyan Indian symbols and designs as well as gems add to the beauty while the metal and gem contrast make them stand out as unique art. Emerald, the green variety of Beryl, is the most famous and valuable green gemstone. Its beautiful green color, combined with durability and rarity, make it one of the most expensive gemstones. Ruby is distinguished for its bright red color, being the most famed and fabled red gemstone. Beside for its bright color, it is a most desirable gem due to its hardness, durability, luster, and rarity. Diamond, the most famed and fabled of all gemstones, is very unique in many ways. Renowned for being the hardest substance on earth, its sparkling fire, durability, and rarity make Diamond the most prized of all gems. 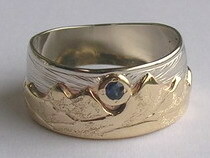 The .02ct and .03ct diamonds add a little sparkle to the mountain themed rings as a sun ( or moon ). This diamond chart will show proportions for V3 ( .03ct ) or V15 ( .15ct ) and others comparing size and numbers. Example; a V2 is a .02ct diamond and I use them for eyes in many of our designs), a V100 is a full 1ct diamond, which is about the size of a pencils eraser, 6.4mm. up depending on size and quality. 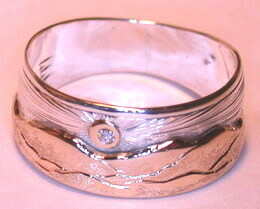 - add $50  to  $200 depending on stone chip used.